The chemical analysis of water provides considerable insight into the health and workings of lakes, rivers, oceans, and groundwater . Water chemistry has helped scientists to define the different currents and circulation of the world's oceans, improved their understanding of water's interactions with Earth's geologic materials, and given insight into the impact of human activities on waterbodies. It also has provided a clearer understanding of the limits of a waterbody's ability to assimilate (take in) some level of pollution without harming the water system, its aquatic plants and animals, and humans who may use the water. Water monitoring and the chemical analysis of water requires careful planning to achieve valid results. The most important step in any monitoring program is the development of a plan, known as a Quality Assurance Project Plan (QAPP), to bring into focus the purpose of water monitoring efforts, the currently known information about the waterbody, and the intended use of the resulting data. Data may be used for such varied purposes as an educational course requirement, a contribution to a statewide database, or even in a lawsuit. Once this information is known, project managers establish specific parameters to be measured, set the level of quality assurance needed to support the intended data use, and determine the detailed steps of a monitoring program. Note how all these elements build on one another in the following example. Suppose a small river flows down the mountains and through an agricultural area. In recent years, during the late summer months, the river has become murky and ceased to support recreational fishing. As a result, the reduction in tourism has had an impact on the regional economy. Earlier monitoring by a state environmental agency indicated that the decline in certain game fish species was due to extreme daily swings in the dissolved oxygen resulting from the respiration and photosynthesis cycles of excessive concentrations of algae . It was believed that the algae growth, in turn, was caused by runoff from the agricultural areas that contributed nutrients to the river in the form of nitrates and phosphorus. Chemical analyses are used in conjunction with biological and physical parameters to characterize the quality and understand the chemical evolution of fresh water. Standardized analytical methods allow the integration of data collected on disparate waterbodies, regardless of geographic location. they met with the local community officials, who all agreed to proceed with the proposal. To document the effectiveness of these agricultural changes, the local leaders agreed to form a watershed council to develop and carry out a water monitoring effort. Once formed, the watershed council set about developing a monitoring plan. The council members documented that the purpose of the monitoring effort was to monitor changes in water quality resulting from changes in agricultural practices. They gathered available historical monitoring data from databases and library searches. The council members discussed the intended uses of the data that they were proposing to acquire. They knew it was primarily to be used to observe any water quality changes that resulted from the changes in farming activities. Council members also wanted the data to be placed on the state environmental monitoring database where it would be available to university researchers and others who might find it useful. Lastly, they all agreed that because of the voluntary spirit of this venture, the data were not intended to be used for enforcement purposes. Nitrate and phosphate levels (to monitor the nutrients). In order to monitor the daily changes in DO and pH, a continuous monitoring probe would be used. Weekly grab samples would be taken for the other parameters. Ascorbic acid spectrophotometric method for phosphate. Each method in turn specifies the sampling procedures in terms of type of container to be used to collect the sample (plastic or glass); preservation requirements once the sample is collected (acidification or refrigeration); and holding-time limits within which the sample must be analyzed. The methods also specify the calibration procedures and quantitation limits of the method. (In analytical chemistry, "to quantitate" means "to quantify" when referring to measurement processes.) Additional QA requirements indicate how many sample duplicates and sample spikes must be run; how often the continuous monitors must have a calibration check performed; and how all the data should be reported. All of these specifications ensure that the analytical results meet the requirements of known data quality in terms of accuracy and precision . With the decision that the data were not to be used for legal enforcement, the watershed council could forego a formal chain-of-custody record that involves documenting the exact location of the sample at all times to ensure it could not have been tampered with between the time of collection and final analysis. As this example has shown, the chemical analysis of water involves many steps that are closely linked: planning, sample collection, analytical chemistry, quality assurance, and data management. If these steps are followed, the data can be used for short-and long-term trending, modeling and predicting, and basic research. If necessary, and if chain-of-custody is employed, the data can also be utilized objectively in litigation. 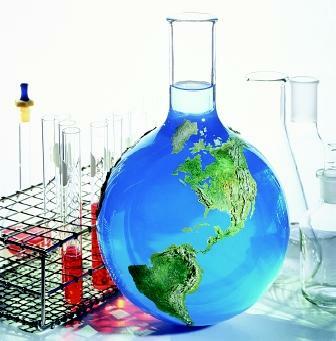 SEE ALSO Chemicals from Agriculture ; Fresh Water, Natural Composition of ; Fresh Water, Physics and Chemistry of . Clesceri, Lenore S., Arnold E. Greenberg, and Andrew D. Eaton, eds. Standard Methods For The Examination of Water and Wastewater, 20th ed. New York: American Public Health Association, American Water Works Association, and Water Environment Federation, 1998. The concentration of a substance in water is usually expressed as milligrams per liter (mg/L) or micrograms per liter (μg/L), which are more casually referred to as parts per million (ppm) or as parts per billion (ppb), respectively. To appreciate the levels being measured, one ppb is equivalent to one sheet of printer paper in a stack of papers nearly 129 kilometers (80 miles) high, or one drop of water in roughly 95,000 liters (25,000 gallons). It is interesting to note that owing to improvements in the chemical analysis of water, many environmental analyses are measuring well beyond the ppb range and into levels of parts per trillion and even parts per quadrillion. 1. How can I best interpretate the quality of chemical analysis for waste water effluent sample and how can you best supervise technical workmanship of laboratory technician? pleas! would you give me the answer for all the above questions?